On November 21 history was made in Nzega District when the first modem gold mine in the country to quarry gold extracted a 6kg piece worth $600,000 after 5 years of exploration and prospecting. This was at the Golden Pride Project at Lusu, 124 miles south of Mwanza, the site of a $50 million joint venture between Australian Resolute Mining and Canadian Samax Resources, the latter recently taken over (for a price of $ 135 million) by Ghana’s Ashanti Goldfields. The Golden Pride Mine, which might become one of the biggest in Africa, sits on an estimated 2.7 million troy ounce gold deposit. It is an open-pit mine 1.67 miles long, 160 metres deep and 400 metres wide. A kilometre away from this open pit is the mine’s processing plant, which includes seven carbon-in-leach tanks, a five-tonne gold extraction circuit and a crusher. Annual production is expected to rise to as much as 150,000 ounces at a production cost of $210 per ounce -far below the world price of about $290 per ounce. Things are looking up in the dusty city of Mwanza and its neighbouring districts. From early discovery up to 1965 Tanzania produced about 3 tonnes of gold per annum but virtually all production stopped following the imposition of widespread nationalisation under the Arusha Declaration. It is difficult to exaggerate however the potential for development of the country arising from this new gold rush. If all present investment plans come to fruition, Tanzania could be producing about 26 tons (855,000 ounces) of gold by 2001 representing some 10% of GDP compared with the present production of about 7 tons a year (2% of GDP) by small scale artisanal diggers. Total reserves are estimated at some 20 million ounces. The Kahama Mining Company at Buzwagi is being developed by Anglogold of South Africa (the world’s largest gold producer -some 200 tons per annum) and Pangea Goldfields of Canada. There are estimated to be about a million ounces of gold to be mined. Anglogold has vast resources of capital (some $20 million was available for investment in the second half of 1998) and is prospecting for gold at other sites in Tanzania. Also in Kahama District, at Bulyanhulu, Sutton Resources of Canada through the Kahama Mining Corporation Ltd., is prospecting deposits which might eventually total 7.2 million ounces. All this activity is bringing about major infrastructural improvements including the upgrading of 80 kms of road from Kahama to the mine site and the laying of a water pipeline from Lake Victoria. Ashanti Goldfields, the 12th largest gold producer in the world, is investing $130 million in Geita District at Nyamulila Hill where there is estimated to be up to 2 million ounces. Ghana, whose gold production increased from 12 tons in 1988 to 56 tons in 1997 shows how rapidly gold production can be increased. An airport is being built at Geita, schools and dispensaries are being rehabilitated and there are plans to revive Nungwe Bay Port on Lake Victoria. Ashanti Goldfields is hoping to benefit from economies of scale through its newly acquired share of Golden Pride. Also a new joint project involving the Tanzanian Defence Forces is expected to increase the benefit to the country by curbing smuggling and better organising the marketing. Tanzania will obtain many benefits from. this new gold rush. The country will get royalties and, after the initial concessions to investors have been allowed for, considerable sums in income and corporation taxes. The recent imposition of VAT at 20% however has proved very unpopular amongst the investment community. There will also be employment opportunities and training in new skills for Tanzanians. Unfortunately, as the latest technology is being used, TA has been told that each mine will employ only about 200 people. Tanzania is widely regarded as Africa’s best prospective exploration after Ghana for its geological potential and political stability. KPMG Peat Marwick Consultant Salim Bashir said that in the long-term mining would be the mainstay of Tanzania’s economy. Tanzania attracted more exploration expenditure in 1998 than any other African country -$57.70 million. Anticipating this surge in mining the Eastern and Southern African Mineral Resources Development Centre has installed the first verification facility in Tanzania. It will assist buyers of gold and gemstones to determine the true value of what they wish to purchase. And the 1,500-strong Institute of Engineeers (IET) is intending to launch a division of mining and metallurgy to promote engineering technology for the fast growing mining sector. Although during the last 18 months the Ministry of Energy and Minerals has issued more than 200 licenses for mineral exploration to local and foreign companies, the smaller gold exploration companies in Mwanza are finding it hard going because of the low gold price. In August last year it touched its lowest for 18 years at $270 an ounce but the price as this issue of TA goes to press is $295 per ounce. South African mines produce 400 tons a year but it is expensive to extract and the industry there is relatively stagnant as far as growth is concerned. Goldfield’s, South Africa’s second biggest gold company, has operating costs of $280 per ounce. It is anticipated that companies like Ashanti and especially Anglogold with their massive capital reserves and the latest cost-cutting technology will, before long, dominate the Tanzanian gold industry. There are no changes in the other nine ministries. Ms Gladness Mziray, Deputy Minister of Health, has retired on medical grounds. The re-introduction of a Ministry of Regional Affairs has been widely criticised as many had hoped that the President would reduce rather than increase by one the number of ministers. The reshuffle was made necessary by the recent loss of two ministers through election petitions. However, former Minister for Industries and Commerce, Dr William Shija, who lost his seat and his ministerial appointment following alleged violation of electoral procedures in the 1995 elections (some 17,000 voters had been unable to cast their votes) regained his Sengerema (Mwanza) seat on October 5 defeating Dr Fortunatus Masha of the United Democratic Party (UDP) by 29,345 to 21,549. The CUF candidate scored 789. In the previous election Shija got 19,917 votes against Masha’s l3,080. The by­election was unusual in having only three candidates. There were none from the main opposition party the NCCR; it is not known whether this was because the party could not agree on a candidate or whether it had finally realised that there could be advantages in cooperating with other opposition parties rather than always competing against them. There was a very heavy turnout. The Dar es Salaam Guardian quoted UDP leader John Cheyo as complaining about the high cost of by-elections – he estimated the cost of this one at Shs 350 million and recommended the adoption of some alternative approach in future for the filling of constituency vacancies. Former NCCR MP for Bunda, Musoma, who lost his seat following a petition alleging irregularities in his campaign at the last elections and who was hoping to regain it in a by-election, had his hopes dashed on September 29 when the Court of Appeal rejected his second appeal against the original judgement. Judge Samatta said he believed that the defeated candidate, former Prime Minister Joseph Warioba, had not been served with a copy of the notice of appeal by Mr Wassira within the stipulated time. Wassira had claimed that he left the notice with a hotel receptionist in Mwanza. Wassira has now appealed again – for the third time. CHADEMA has selected Mrs Aripa Geoffrey Marealle as its new ‘Special Seat’ MP to succeed Mrs Mary Kabigi who died in April. Meanwhile, ‘The African’ reported in October that CHADEMA chairman Bob Makani had renewed his appeal for opposition candidates to field common candidates in the October 2000 elections so as to give the opposition a chance to beat the CCM. On November 8 the Sunday Observer reported the first signs of a melting of the icy relationship between Mrema and his arch rival in the same party, Secretary General Mabere Marando, when both were attacking the CCM for owing the defunct National Social Security Fund more than Shs 500,000 in loans. Further melting of the political atmosphere was reported in the Daily Mail on October 13. Mrema was said to have caused surprise when he turned up at the send-off party given by CCM Vice-Chairman John Malecela for his daughter Mwendwa prior to her marriage. Mr Malecela gave special thanks at the party at his residence (attended by 400 people including President Mkapa) to Mr Mrema. “This shows” he said “that our differences in politics do not affect our social relations”. The police, together with the US FBI, have been very active in recent weeks in trying to find those responsible for the blowing up of the American embassy in Dar es Salaam. Two suspects, one with a Tanzanian/Congolese passport and the other a Tanzanian were arrested on September 21 accused of murdering 11 Tanzanians in the bombing on August 7 but were later released. Some 30 people have been arrested and then later released in this case. On October 16 police released pictures of the vehicles used in the attack -a 1987 Nissan Atlas Refrigeration truck (thought to have carried the bomb) and a Suzuki Samurai 1989 used by the suspects. Two further suspects, an Egyptian and a Zanzibari, were put on trial for murder in October at the Kisitu magistrates Court. Transparency International’s 1998 ‘Corruption Perception Index’ (CPI), quoted in the East African, placed Tanzania 81st out of 85 countries – on a par with Nigeria. While Denmark scored 10 out of 10 Tanzania scored only 1.9. The writer of the article found this hard to believe and pointed out that the index was a measure of perception, not actual levels, of corruption. There was said to be a joke in Dar es Salaam to the effect that you paid bribes in Tanzania ‘at your own risk’ since the system was so complex that nobody could guarantee that a bribe would be effective. President Mkapa, who has been widely criticised for his failure to deal more vigorously with rampant corruption, has been stepping up his attack. On November 4 he halted an address to the National Assembly, after he had said that he had directed all Cabinet ministers to present to him lists of corrupt officials, when opposition MP’s began to murmur. He waited two minutes and then pointed out that MP’s had parliamentary immunity and could give him the names of corrupt people right away. When John Cheyo MP (UDP) stood up there were cheers from the floor but he failed to give any names. The President said that 13 corruption cases were in court and added that, in future, he would sack Civil servants and not grant them their normal benefits – only to be told by his Attorney General that there were certain laws involved in this matter. The President then said that if he was presented with circumstantial evidence – even if it could not withstand the scrutiny of the law – he would sack the persons concerned. The CCM party has instructed senior officials to declare their assets and they have begun to do so. Prime Minister Frederick Sumaye declared that he had two houses, five plots, three vehicles, two tractors and a 40-acre farm with 115 domestic animals. He was criticised in the press when he revealed that he had also secured a $74,000 loan from the Parastatal Pension Fund. Minister for Works Anna Abdullah has three houses, 60 h. of farmland and Shs 1 million ($1,480) in bank accounts. Tourism Minister Zakia Meghji has two houses, an undeveloped plot, three vehicles and Shs 500,000 and $400 in cash. After the President had again demanded that officials should report to him the names of corrupt persons in their ministries, the Dar es Salaam Daily Mail reacted sceptically – in a leading article on October 8. ‘Who among the administrators ordered to report on corruption is clean enough to cast the first stone?’ it asked. ‘It is more important to analyse and curb the causes of corruption’. However, another government minister resigned on August 10. Minister of State in the President’s Office Dr Hassy Kitine resigned following allegations concerning misappropriation of public funds and, in particular, allegations concerning medical expenses for his wife in the United States. On October 27 it was reported in the Guardian that the President had retired five senior officials in the Ministry of Agriculture and Cooperatives and two education officials. And The African then reported that the Police had been instructed to apprehend all government and parastastal vehicles found on the road after 6pm without special authorisation. Two cases are under way involving Opposition NCCR Chairman Augustine Mrema. He had made a name for himself some years ago as an anti-corruption fighter when he was Deputy Prime Minister in President Mwinyi’s government. But on August 10 he was grilled for seven hours by the Parliamentary Privileges Standing Committee over allegations of breaching privileges at public rallies following his suspension for 40 days by Parliament. He had accused the government of threatening to kill him (details in TA No.6l) and faced 8 charges. On November 13 the committee presented a 33-page report recommending that further action should be taken against him if he did not apologise. Forty MP’s stated that they wanted to take part in the debate, but, according, to the New African, after Mrema had refused to apologise (in a long speech which eventually ran out of time) the Deputy Speaker adjourned the debate until January 1999. Mrema was alleged to have accused his fellow MP’s of being vibaka (rapists). Mrema is rarely out of the news and was featured in a full page article in ‘New African’ in October. All kinds of different views about him were quoted. Some CCM MP’s said he had taken leave of his senses when he said that there was a plot to kill him (TA No. 61). Others were said to have alleged that he was ‘mad’ and should be examined by psychiatrists. Mrema said he was fine, though he was radical “like some of the honourable members of parliament who are gay though nobody bothers to send them to psychiatrists”. Another MP was quoted as saying that “in Zambia, MP’s committing Mrema’s offence (presumably false accusation -Ed.) are jailed”. The New African article went on: ‘But in all this controversy, Mrema maintains an unlikely friendship with father figure Julius Nyerere. He recently thanked Nyerere for protecting him. “I sleep at home because of him. Otherwise they would have jailed me” Mrema was quoted as saying. In a very long-running court case, also involving Mrema, which is attracting great public interest, he and Dr Masumbuko Lamwai, a fellow NCCR MP with whom he has since fallen out, were jointly accused for claiming, in October 1996, that government and CCM officials (including former Finance Minister Prof. Mbilinyi) had received Shs 900 million in bribes to give a tax rebate to crude oil importers. Amongst the many witnesses has been former Tourism Minister Juma Ngasongwa who denied in court having received a bribe from the Mwanza Fish Industries to help them with tax remissions. Ngasongwa, who had been alleged in the Warioba report on corruption (see earlier issues of TA) to have been bribed by some United Arab Emirates leaders to issue them with presidential licenses to hunt, said that he had a right to do so as it was a reward after they had already been issued with a hunting permit. This was covered by the law on wildlife. Ngasongwa stated that he had already been cleared of bribery allegations by the parliamentary select committee and by the Presidential Commission against Corruption. The Mbilinyi case continues. In an article in the Sunday Observer, Peter Msungu wondered whether corruption was always a bad thing. He wrote: ‘some people argue that it can have beneficial effects such as non-violent access to government administration when political channels are blocked, or, as a means of lessening the potentially crippling tension between civil servants and politicians by linking them in an easily discerned network of self-interest. As soon as troops from Zimbabwe and Angola joined in the war in the Congo on August 24 and 25, Tanzania withdrew its 600 ­strong military training mission. Tanzania made it clear that it did not want to be involved in widening the conflict. The soldiers were evacuated by South African planes. Rebel forces had been planning to attack them according to a report in the Dar es Salaam Guardian. Large numbers of refugees from the Congo civil war have been arriving in Kigoma. The head of the rebel movement, officially Chairman of the political wing of the Rassemblement Congolais pour la Democratie, is Ernest Wamba Dia Wamba who, until a few months ago, was a history professor at Dar es Salaam University. He went into exile during the Mobuto years. The high hopes of the Commonwealth Secretariat, which has been trying for two years to bring about a settlement between government and opposition in Zanzibar (see TA No 61), seem to have been dashed once again. According to an article in the East African on November 16 by Salim Salim, (a former Press Secretary to the present leader ofthe opposition Civic United Front (CUF) Seif Sharrif Hamad, Zanzibar President Salmin Amour has ‘demonstrated once again that he is not prepared to come to terms with the opposition party’. The President was quoted as saying that no foreigner, be he an individual or an organisation, could bring harmony to the islands. The President was also said to have brushed aside an appeal by Tanzanian Vice-President, Dr Omar Ali Juma (himself a Zanzibari) made on the same platform two days earlier, for Zanzibar’s leaders to give full support to the Commonwealth peace initiative. Dr Juma was quoted in the Guardian as saying that the efforts of Commonwealth Secretary General Chief Emeka Anyaoku were never directed towards uniting CCM and CUF and by no means aimed at establishing a coalition government. The Chief had felt that an opening had to be made somewhere to start engaging them in dialogue. However, President Mkapa has again praised Dr. Amour for his firm stand against ‘opposition manoeuvres aimed at causing mistrust among the people’. According to the Daily News, Seif Shariff Hamad announced to the CUF General Council at a meeting in Dar es Salaam on August 9, that CUF would recognise the government of Dr Amour and was ending its boycott of the Zanzibar Assembly ‘for the benefit of all Zanzibaris’. The CUF National Congress agreed unanimously to sign compromise protocols proposed by the Commonwealth. Seif Shariff claimed that, under the proposed agreement, the Electoral Commission would be disbanded and a new one formed including neutral members; new voters lists would be drawn up; the Zanzibar constitution could be reviewed; some special seats in the House of Assembly would be made available to CUF; President Amour would submit a list of person whose houses had been destroyed; sacked students and civil servants would be reinstated; treason suspects would be set free. He asked his members to be patient and to avoid confrontation. But President Amour clearly sees that he is winning the battle. He told a large crowd on August 22 that CUF was politically finished and was now at the mercy of the rank and file of the CCM. He accused CUF of being engaged in all sorts of political trickery and deceit in Pemba by telling the people there that the time had come for the Isles to have a President from Pemba. Referring to the negotiations under Commonwealth auspices he said that CUF had rejected Dr Anyaoku’s recommendations three times. ‘There would not be a government of national unity. Chief Anyaoku announced in a message from Kuala Lumpur, where he was attending the Commonwealth Games, that he was adjourning talks on the package of proposals he had made in March 1998 for a solution of the problem (which had been accepted unanimously by CUF) ‘to allow CCM to complete its deliberations on them’. The CCM was due to respond by not later than its Central Committee meeting on October 10. CCM had set up a special seven-member committee to study the proposals but on October 11 the Guardian reported that the said meeting did not take place. The treason trial of 18 CUF leaders on charges of treason has now been going on for more than a year and the preliminary enquiry has been adjourned 25 times to enable the police to finalise their investigations. On August 4 there was a legal wrangle on procedures and efforts were made to persuade the Attorney General to brief the court on the evidence he had so far collected. The Prosecutor, Police Superintendent Patric Biatao, said that the Attorney General was reluctant to send an affidavit or a state attorney to shed light on the evidence because the court had not informed him in writing. The defence regarded this as a flimsy excuse. A ruling on what to do next was postponed because the magistrate fell ill.
On August 18 the Magistrate gave the Attorney General 10 days to present an affidavit to explain how far he had got with the evidence and why four parliamentarians had been arrested among the 18 accused without following procedures. On September 1 affidavits were produced which said that in the case of the four MP’s the Attorney General had given his consent within a day of each arrest, in accordance with the law. One had been charged with organising an illegal demonstration, two were charged with inciting the public and Juma Duni MP with importing army uniforms. The defence team questioned every aspect of the affidavits and, after taking a one hour leave to consult legal books, Senior Superintendant of Police John Kimario asked for more time to consult the Attorney General. On September 29 the defence continued to challenge the AG’s affidavit saying that his consent to the arrest of the four seemed to have been given after they were arrested. On October 13 the court ordered the AG to state within a week whether he had given consent to the arrest of the four. The court also ordered the prosecution to show cause why the hearings of the trial proper should not begin in the absence of additional suspects and to state how much more time it needed to complete investigations. (Dar es Salaam University has been modernising Swahili for many years. Readers may wish to update their knowledge of the language and Ben Rawlence therefore has agreed to contribute to this process. His first article follows -Editor). Mmasai alikuwa juu baada ya kuitwa buzi (a Masai became angry after being called a goat). So ran the headline in a local newspaper. It seems as though the proverb is true that: Jogoo la shamba haliwiki mjini (the cockerel from the country doesn’t crow in the town). kuja juu (to become angry); kuachwa hoi (to die …of laughing); daladala (minibus); kujichubua (to bleach oneself); mkorogo (bleaching mixture); kucharuka (to explode); mtasha (mzungu – white guy); kitu kidogo/chai (a bribe); wamachinga (street sellers). 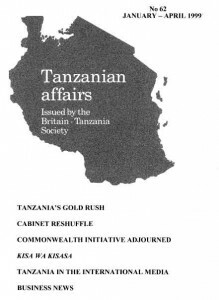 The Commonwealth Development Corporation’s THE MAGAZINE (September 1998) wrote about the ‘outstanding success of its Tanzania Venture Capital Fund in supporting, with its financial muscle, Tanzania Tea Packers during the last three years’. Tanzania Tea Packers blends and packs tea under its brand name Chai Bora and sells three blends – Nguvu Blend, Supreme Blend and Blue Label, and its success has been in breaking the modern rules of advertising and going back to 30-year old techniques -promotional discounts, 20% extra tea free in the pack -a first for Tanzania; wall signs; bill boards; radio jingles; simple phrasing like ‘Good Tea’ plus some exciting modern visual designs and the most modern packaging available. Kahawa Bora was due to be introduced in September 1998, then Soda Bora and then lots of other little boras, ‘all of whose aim is to provide the consumer with a simple product, at a reasonable price, a standard quality obeying environmental and food norms and, making money’. The VSO publication ORBIT published in its third quarter 1998 issue an account of the Zanzibar International Film Festival held there recently. It wrote: ‘It was a unique film festival which questioned the overwhelming presence of Hollywood and Indian Bollywood films in Africa by screening nearly 100 films from the ‘dhow’ countries, most of them African in origin ….. these were films with social realism, depth and diversity ….. one was ‘Bongo Beat’, a Tanzanian-made film featuring local musical hero Ronny Ongala and another ‘Flame’ about two female teenagers who sign up to fight in Zimbabwe’s war. By the end of the week over 1,000 people a night were cramming into the open-air fort beneath a clear sky, straining their ears above the noise of the insects to enjoy the films …. but local cinema owner Firoz complained that he lost money by showing festival films’. After the festival he was happy to go back to his regular and highly popular rota of Indian films, Titanic and James Bond. The article quoted a UNESCO estimate that film attendance in Tanzania totals five million a year -a major leisure pursuit. But Michael Booth, writing in the INDEPENDENT ON SUNDAY (October 25) went out to one of the 25 ‘Village Panorama’s designed to bring African-made films to African audiences. At Bambi, two hours drive from Stone Town, he found 500 people waiting for the performance. The main film was Black Ninja Group, a Dar es Salaam-made feature -‘it was probably the worst film I had ever seen’ he wrote. ‘It was a non-sensical tale of mainly kung fu bouts between baddies in balaclavas and policemen, and was edited with an axe. But it went down well with the audience who made off into the night around midnight still shouting and laughing…. Meanwhile, he EAST AFRICAN reported that Tanzania was the only country in East Africa to submit a film to M-Net’s 4th All Africa Film Awards in Pretoria in November. The film, Maangamizi – The Ancient One, did not win an award. The South African press continues to take a close interest in Tanzania. The SUNDAY INDEPENDENT (October 25) wrote about the estimated 15,000 prostitutes in the country. ‘Recently, eight pupils at Songea’s Girls Secondary School were expelled for running a brothel using a building near the school. The girls were found naked in the house when a team of teachers invaded it. Six customers ran away. The pupils said they were forced to make money that way because their parents could not give them any. Peggy Mengoli, a writer to the editor of the MAIL AND GUARDIAN (October 10) referred to Deputy President Thabo Mbeki’s call for an ‘African Renaissance’. He associated it with Julius Nyerere’s ‘African Socialism’ and wrote that, ‘when he (Nyerere) got into his stride he took control of the media, banned opposition parties, controlled the trade unions, denied members the right to strike, jailed people without trial for merely protesting and nationalised industries which had previously been doing well… leaving Tanzania one of the poorest countries on earth’. The writer concluded that ‘if Mbeki follows in the footsteps of Nyerere, it won’t be to oversee an African renaissance but an African mass funeral’. Another article on the same day in the same paper under the heading ‘Tanzania feels the pain of indifference’ quoted Christopher Mwakasese, Director of Tanzania’s ‘Social and Economic Trust’ (an NGO) as being angry about the way in which Africa’s needs for debt relief were being handled by the World Bank and IMF. He said that out of 25 World Bank agricultural projects in Tanzania 13 had negative rates of return. The South African BUSINESS DAY (November 18) reported that the South African company Murray and Roberts is going to build, starting in 1999 a large shopping complex in Dar es Salaam to be know as the Mali Msasani in which other South African firms are expected to open shops –Thank you David Leishman for sending these items from South Africa Editor. A supplement on Tanzania produced by PM Communications for the SUNDAY TELEGRAPH (November 15) included statements by government officials and others (covering all sectors) and pointed out the rapid development of telecommunications since the sector was liberalised in 1993. Tritel, one of the main operators of cellular telephones said that it has gained 10,000 subscribers in two and a half years, and with Mobitel, the other main operator, there would be around 40,000 mobile phone users by the end of 1999. Tritel is a joint venture with a Malaysian company which has invested almost $40 million. Mobitel, which has the greater share of the market, is a joint venture with Millicom International Cellular and is busy extending its operations to Mbeya, Shinyanga and Tanga –Thank you Donald Wright for sending this item ­Editor. A new glossy international travel magazine called SWAHILI COAST, which is designed to promote coastal eco-tourism, published its first issue in July. The first article advertised the Zanzibar Film Festival and the second article, supported by beautiful reproductions, featured Tingatinga art. Professor Sherrif wrote about the sad life of Princess Salme, the daughter of Seyyid Said, the nineteenth century ruler of Oman and Zanzibar, who fell in love with a young German trader, Rudolph Heinrich Ruete, who lived only three years after their marriage. The princess resided in Germany for most of the rest of her life. The concluding article was a short history of Mafia by Peter Byme. Another volunteer, Patrick Wilson (from ‘Health Projects Abroad ­ HPA’) has been describing life in a Tanzanian village. His story filled a page in the SUNDAY TIMES MAGAZINE (May 17). ‘ ……. people have a strong sense of communal responsibility. Recently, when a man was hit on the head and couldn’t work for months, every family in the village gave his family rice or vegetables. The villagers are amused at our attitude to work; when they learnt that an HPA engineer had been working a l2-hour day in England, they were flabbergasted. “Was your family starving?” they asked …… a visit to the movies is like nothing I’ve ever experienced. One day we heard we could see a film in a certain village. After riding on our Chinese bicycles for two hours, we arrived to find a man with a video. We watched it outside on a TV run from half an old car which was so noisy that we could hardly hear what was going on. The video turned out to be a terrible Chinese martial arts film dubbed into American Irish. Every time there was a fight scene the audience leapt to its feet and an imitation fight ensued. Then the car engine cut out because it had run out of petrol. Some men cycled off furiously to find petrol. An hour later petrol was found and the video resumed. But it soon cut out again. The whole thing took all day’ –Thank you Cath Rowlatt for sending us this story -Editor. ‘What previous chief executives of the National Bank of Commerce (NBC 1997 Ltd) could not achieve in several years, Dr. Francis Mlozi and his team have accomplished in 10 months. Mlozi has turned the crumbling, debt laden bank from a dying loser to a profitable winner’ -so wrote BUSINESS IN AFRICA in its October-November 1998 issue. The article was full of praise for the newly restructured bank. The author wrote that Mlozi’s first task had been that of converting fear into hope for his 1,000 staff and ultimately for his customers. Thousands of customers had left. Just three months into his “change for the better programme’, NBC 1997 hit profits. These totalled Shs 2.5 billion in the last quarter of 1997 but by June 1998 had reached the “incredible’ figure of Shs 10.5 billion. Mlozi considers Tanzania ‘over-banked’ -there are now 23 commercial banks in the country -but this competitiveness was not negative in the short term he said. The March 1998 issue of REVIEW OF INTERNATIONAL CO­OPERATION contained an article by John Launder analysing the causes of the virtual collapse of certain cooperatives in Eastern and Southern Africa (with particular reference to Tanzania) and how this has affected agricultural industries. He concludes that the effect of liberalisation of marketing has been positive for consumers and larger traders but has been a negative experience for many farmers and may have harmed agricultural development. The lack of support services for small traders, particularly for finance, has delayed the establishment of an efficient marketing system. Liberalisation was poorly managed and was introduced too quickly after structural adjustment started. He concludes that a key issue is the integration of cooperatives and other marketers to produce an effective market base for agricultural development ­Thank you Peter Yea for sending this item -Editor. The GUARDIAN WEEKLY (October 18) pointed out that when Asian currencies collapsed last year the IMF came to the rescue with multi-billion dollar bail-outs. However, since 1985 when Tanzania started its IMF structural adjustment programme, the Shilling had been devalued by 1,500% yet the country did not qualify for debt relief until 2002. The article quoted Christopher Mwakasese of the Tanzania Social and Economic Trust as complaining about this and also about the World Bank demanding repayment of loans for its own badly designed projects. Out of 25 agricultural projects 13 had had a negative rate of return, he said. Thank you John Pearce for sending this item from Australia ­Editor. DEVELOPMENTS, the journal of Britain’s Department of International Development, had a page on the proposed new £2.5 billion tourist project in the Nungwi peninsular in northern Zanzibar in its Issue 3 of 1998. The ‘East African Development Company’ has leased 57 sq. kms. to create a resort which is intended to include 14-16 luxury hotels, timeshare villas, a world trade centre, three golf courses and Olympic-size swimming pools. But ‘Tourism Concern’ is expressing alarm about the 20,000 local people who may have to be uprooted and what it terms the massive environmental damage which would be caused. The developers deny the charges. They said that the government would have 26% of the shares in the joint company and that the people would receive water, electricity, sewerage and new roads under the project. Criticism of the project was much stronger in the London OBSERVER (August 30) which had an item on the front page and a full page inside under the heading ‘On the Crooked Road to Zanzibar’ in which it claimed that two British businessmen with criminal records were masterminding the project to turn the ‘paradise’ island of Zanzibar into a playground for rich tourists. The Observer’s reporters, having tracked down the businessmen in addresses in Hampshire, the Isle of Man and Cyprus were left feeling that the necessary funds would never be raised. Villagers at Nungwi were found either not to know anything about the project or too afraid to speak about it except a certain dhow maker (who had been making dhows since he was 15) and was very concerned about losing his living. In its series ‘About Us’ the BBC’s FOCUS ON AFRICA (October­December) featured its man in Zanzibar, Ally Saleh and his blue bicycle -a bike which he claimed was more famous in Zanzibar than President Amour’s Mercedes 280. ‘I take my job very seriously’ he wrote ‘and have even managed to shake the government a few times. And the government has shaken me .. .I’ve been visited by plain-clothes policemen on more than one occasion and I’m not exactly a stranger to the inside of a prison cell. I spent a 30-day vacation in Zanzibar’s central jail in May 1998 after I was accused of taking part in an illegal demonstration …. ‘ Sal eh, who is disabled following polio at the age of four, concluded: ‘Everyone tells me to get rid of my trusty bicycle and get a car. A car? What for? NEW AFRICAN (December) shared the surprise of many on learning that the Tanzanian Government had suddenly decided to liberalise its arms trade at a time when shootings and killings by gangsters are frequently hitting the headlines. This was a radical change of policy, the article wrote, and followed the bankruptcy of the government owned company which had previously controlled the arms trade. But Home Affairs Minister Ali Ameir Mohamed denied the dangers. “Guns are not going to be sold like tomatoes in the market” he said. “Only experienced former army officers will be arms importers and only light weapons will be traded”. Tanzania is poised to be Africa’s next ECONOMIC GIANT after South Africa, should the flow of investments, trade and stability be sustained. It had all the potential and natural resources to surge ahead in social and economic development – Rev. Charles Stith, US Ambassador to Tanzania, quoted in the Daily News. The TRUST BANK was closed on September 19 and the passports of its senior foreign officials were seized. This followed the takeover by the Central Bank of Kenya of the operations of the Trust Bank HQ in Nairobi due to insolvency. There had been a run on the bank by panicking depositors on September 18 when Shs 200 million had been withdrawn in a morning. By the end of November the bank was asking depositors to help rescue the bank. Under its plan there would be no curbs on withdrawals up to Shs 1.5 million but sums grater than this would be released over two years -Daily News. A 25 year concession agreement has been signed under which the KILIMANJARO INTERNATIONAL AIRPORT has been taken over by a local company -Kilimanjaro Airport Development Company (KADCO) a subsidiary of Mott MacDonald of the UK. Greenland Bank Ltd. in collaboration with Thomas Cook International has launched a ‘MONEYGRAM SERVICE’ which it claims will provide transferred money from anywhere in the world ‘in ten minutes’. The launching ceremony of this service was held at the Sea Cliff Hotel in Dar es Salaam -The Sunday Observer. The government has washed its hands of the eight-months long conflict between TANESCO and the Malaysian-sponsored Independent Power Tanzania Ltd (IPTL) electricity project (see earlier issues of Tanzanian Affairs). TANESCO has presented its case to the Washington-based International Centre for the Settlement of Disputes (ICSID) -East African. Zanzibar has passed a bill to introduce 15% VAT early in 1999. Tanzania’s mainland VAT rate is 20% -Business in Africa. Mwanza Regional Commissioner James Luhanga has announced that, in spite of a temporary ban on importation of LAKE VICTORIA FISH into the EU (because of alleged cholera), new markets had been developed in the Middle East, Australia and the Far East. Tanzania had exported Shs 28 billion worth of fish last year, the highest ever and twice the receipts of 1996. Major General Luhanga said that Nile Perch was in high demand because experts say it is free from cholesterol -Daily News. The foundation stone has been laid by President Mkapa of the long-awaited, $25 million, kilometre-long BRIDGE over the Rufiji River at Ndundu. The bridge is expected to be completed in 2000. The project is part of a 508km tarmac road project from Dar es Salaam to Lindi. Finance is being provided by the OPEC Fund, the Kuwait Fund and the Saudi Arabian Government -East African. Tanzania’s COFFEE INDUSTRY (240,000 hectares) has an uncertain future according to ‘Business in Africa’ (October­November). It wrote: ‘For the last ten years production has stagnated at an average of 50,000 tonnes annually and current output at about 250kgs per hectare is among the lowest in sub­Saharan Africa (Zimbabwe -700-1,000 kgs per hectare), …. Causes include fluctuating coffee prices, high taxation, high cost of fertilisers and pesticides, low quality seedlings, under-funding of research…but the main cause is ageing coffee trees -many are over 70 years old and beyond their economic viability. However, some 17 new hybrid varieties of coffee with promising pest resistance have been developed, the EU is launching a $14 million rehabilitation scheme (six million seedlings) and experts say that Tanzania is capable of producing 145,000 tonnes per annum’. Suzie Teete, Human Resources Manager of the TANZANIA CIGARETTE COMPANY, is advertising for Tanzanians living abroad to take up a variety of posts in the company. Starting salaries -about Shs 500,000. South Africa’s ‘Trans-Africa RAILWAY Corporation’ has been given a 20-year concession to operate on the Tanzania Railways Corporation network. If it receives tax incentive clearance, it will run three locomotives and 200 wagons (shipped from Durban). They will be adjusted to fit Tanzania’s narrow 1,000mm gauge after conversion from the 1,067 mm South African gauge -East African. The government has sold its 34% share of Tanzania Portland CEMENT Company to companies in Norway and Sweden for $8.45 million -Daily News.